In case you missed it, there were several photos of an empty arena during the Florida Panthers game last night. People quickly tagged me, mentioned me and emailed last night with references to moving the Panthers to Seattle. I get it, it looks bad and we knew this was coming based on announcements from the new owner in September. As many of you know, I have never been a fan for relocation as most attendance drops are short term in view and usually tied to poor performance on the ice. So I quickly reminded people that it was not too long ago that the Penguins, Blackhawks and Bruins were all lagers in the attendance department. Yes it does look bad in Florida. Can they turn it around? I don’t know. Simply stating Hockey doesn’t work in Florida is ignoring a very successful franchise just 200 miles away. Travis Hughes from SBNation wrote a great piece on the matter yesterday, do check it out. As Travis points out, other than their magical run to the Cup Finals in 1996, success on the ice has been limited. 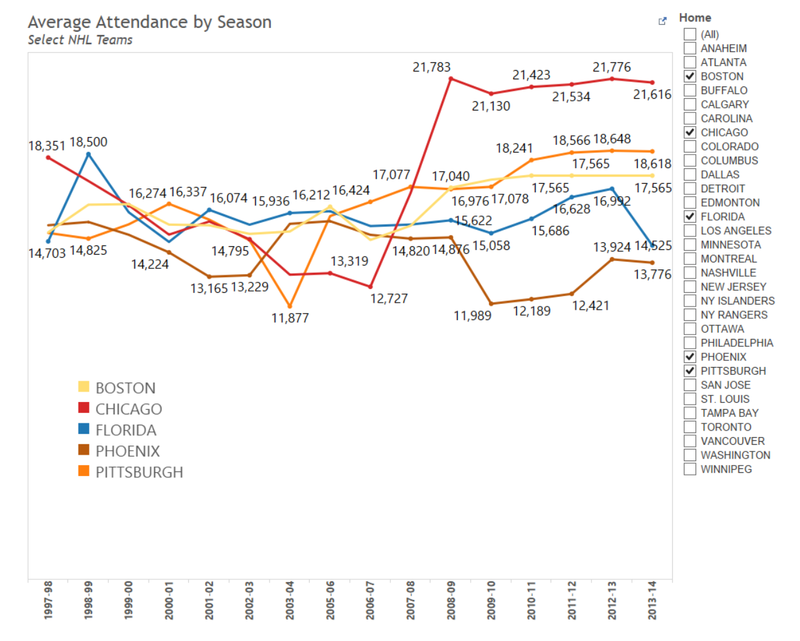 There is only so long customers will pay for a poor product which is evident if you look at Boston, Chicago and Pittsburgh historical attendance. As several native Seattleites have pointed out, there were some really dark days in the Kingdome for both the Mariners and the Seahawks. For those that don’t know, the Panthers were sold to a new owner, Vinnie Viola last year. He is trying to turn this franchise around so give him a chance. I’m a newly relocated citizen to Raleigh, NC from Southeastern Ky. I immediately took an interest in the Carolina Hurricanes simply because we had no pro teams of any sort within 3 hours or so. It’s a Kentucky Wildcat state and that’s it. I’ve attended 3 of the 4 home games the Canes have played here in Raleigh so far this year (game 4 against the Kings conflicted with my work schedule) and I must say it’s very disheartening to see the apparent ‘fair weather’ fan identity being very true for hockey fans in the area. Their game against Arizona was the lowest attended game I’ve been to so far, drawing somewhere between 10,000 – 11,000. The graph in your post really sparked an interest in me, and some hope. I understand Chicago is a MUCH bigger market than the Raleigh/Durham area, but their attendance was apparently in the tank up until they became Cup contenders. I feel sorry for the fans who actually attend games in these ‘smaller’ market areas. Tickets are very affordable for Hurricanes home games, and I’m sure they are for Panthers games as well. With teams like the Islanders consistently drawing lower numbers of fans, it’s a wonder they haven’t been sold or reloacted (even though they’re moving to Brooklyn next season). It’s generally a scary feeling for someone such as myself who finally has someone to cheer for within a 30 minute drive of my home. Hopefully the fans of Seattle can get a hockey team to the area. I’m sure it was a blow to lose a franchise as great as the Sonics all those years ago. It would be appreciated there. The fans of Quebec city and the former home of my Hurricanes in Hartford are clamoring for a franchise to be relocated to their cities once again. What most folks outside of Florida fail to realize is that the Panthers will always be #4 behind the Fins (1), the Heat (2) , and the Fish (3). Miami, after Atlanta, is the worst city in the USA in supporting sports franchises, regardless of the win/loss record on the field. Heck, the Braves in Atlanta could barely muster 85% capacity for home playoff games a few years back. Just 4 hours north of Miami in Tampa the situation is polar opposite. Tampa has a great owner in Jeff Vinik who fully understands the importance of community involvement and charity as building blocks to winning the hearts and loyalty of the casual fans that mean tbe difference between 12k and 19k attendance.However, even during the dark days of the previous Tampa ownership group there was always support for the team as Tampa enjoys a strong hockey fanbase. Miami /Estero does not enjoy that fan passion and will never get it- its just not the right demographic for hockey. I have lived in Tampa for the past 25 years after growing up on Long Island during the sad early days and then the Al Arbour Dynasty days of the Islanders . When I moved to Tampa to go to college I purchased season tickets the inaugural season for the expansion Lightning when they played in a 9,000 seat capacity glorified barn. I was lucky to have sat in the stands when Captain Dave skated with the Cup at the Ice Palace. I know hockey. I love hockey. I have sat through bad, good, great, then bad and now finally good hockey again and I can assure you with 99% certainty that the Panthers will never, ever, enjoy any meaningful support from their fans aside from the fairweather fans who magically appear when the team becomes-if ever- relevant. Move them to Seattle where the city has hockey passion and is ready to build another winner. Personal confession: I am relocating to Seattle in the near future and will be ready to support my new home hockey team because hockey withdrawal is a painful experience that I don’t look forward to experiencing again.